What was your greatest writing challenge? What’s your idea of literary success? This intriguing mystery by an Indian author is set entirely in Europe, in the historic city of Salzburg, Austria. The novel brings to life the beauty and rich heritage of an old European city, which serves as a striking backdrop for an exciting intrigue. The three-century-old heart of a princely archbishop is mysteriously stolen from its place of rest. Who would do such a thing, and why? An insane criminal is out to destroy the pillars of the city’s heritage and culture. Re, a photo journalist and psychic, Isabel the beautiful local historian, police chief Stefan and hotelier Dan, who is managing the prestigious high profile Salzburg Global Seminar in the Schloss, are compelled to work together to stop impending disaster. As the threats materialise and mayhem unfolds, they must figure out which of the city’s many historic landmarks will be the next target, and prevent further chaos. It’s a well-crafted, exciting story that will keep you turning the pages all night long. The mystery and fast-paced action are cleverly plotted. There are deliciously interwoven mysteries within mysteries, leaving readers with never a dull moment. There’s even a mystery from the historic past, coming alive in the present. Renowned theatre director Max Reinhardt once owned the majestic Schloss, a luxurious palace by the lake. Forced to flee the Nazi advance during World War II, he left behind a series of complex clues to an unsolved mystery, a hidden secret. As the hours until the next attacks tick away, our heroes must solve the clues and hand over the hidden treasure to the shadowy perpetrator of the attacks on the city’s landmarks. This is the only hope to halt further destruction. Isabel’s American husband Justin has vanished, and is suspected to be dead. He has left cryptic messages which connect to the attacks on the city. Is Isabel really an innocent, grieving wife, or does she have a hand in Justin’s murder? Is she truly working to solve the clues and save the city, or is she in league with the enemy? Monideepa Sahu is a former bank manager. 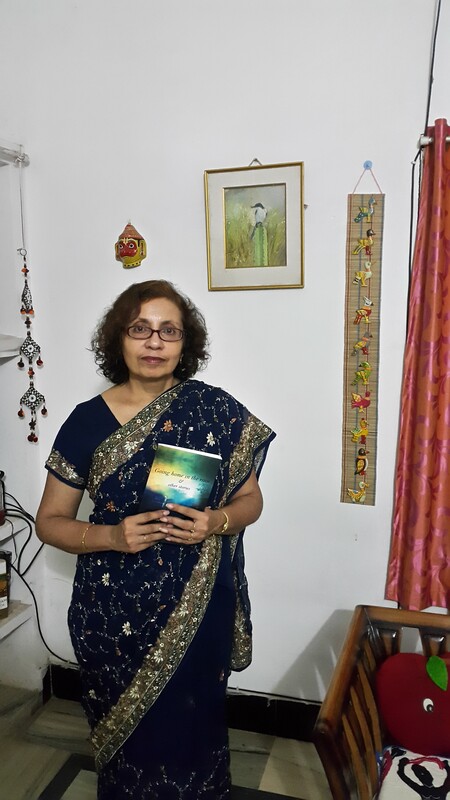 She has authored Going Home in the Rain, and Other Stories (Kitaab, Singapore), Riddle of the Seventh Stone (Zubaan) and Rabindranath Tagore: The Renaissance Man (Penguin/Puffin). Her short fiction has been accepted into collections from Central Michigan University, Northeastern Illinois University, Marshall Cavendish (Singapore), Puffin, Scholastic India, and elsewhere. She has been a Views columnist with Bangalore Mirror (Times of India Group), and regularly writes for Deccan Herald and other mainstream publications. She is Fiction Editor with Kitaab. Spending her growing years in New Delhi and Washington D. C., and a couple of decades in Bangalore, she is now living out of suitcases and packing boxes. During her nomadic phases, she has also called Hyderabad, Mumbai, Bhubaneswar and charming small towns in Karnataka and Andhra Pradesh her home. She blogs at: http://monideepa.blogspot.in/. RKB: There’s a quote in your blog which reads “Creativity is allowing yourself to make mistakes. Art is knowing which ones to keep. Musings from someone who sees stories everywhere.” Can you share some more musings on this? MS: I see stories everywhere; in overheard conversations, in the gestures and body language of passing strangers, or a post-it note stuck on someone’s fridge door. I often play with various themes, techniques and styles. Fantasy, ghostly supernatural stories, “literary” stories, magic realism, have all touched my writings at different times. While I have a soft corner for literary fiction, it’s challenging to step out of the comfort zone of a favourite genre. It’s also more fun to come up with the unexpected. Creative artists need to play freely with ideas and modes of expression, and there will be mistakes and false steps. The end product may be quite different from the original plan. The perceptive artist will realise which of these deviations are not working. The artist will also realise that some tangents from the original plan are leading to interesting, if unexpected paths. Those are the mistakes to keep, and work upon. The short story “Dhatura” is one such “mistake”. I imagined Surpanakha as a wild character with her own code of ethics. When I submitted a draft to an international online workshop, a fellow writer saw a strong combination of horror and erotica, which I hadn’t initially planned. This “mistake” was definitely a keeper. Just as a stalk holds together its bunch of grapes, and the stem of a pinnate leaf its double row of leaflets, the idea of journeys runs like a spine through this book of fourteen stories. And the journeys are not necessarily from one physical place to another. They are also from one inner point, a state of mind, into another.